I have already used the logit transform on my outcome variables (which are displayed in percentages). However, this obviously gives me -INF values and since my data includes a lot of zeros in some instances, this makes it hard to analyse. I have now tried an empirical logit transform, adding the smallest non-zero promotion to the numerator and denominator of my variables to remove the -INF values (as suggested in http://www.esajournals.org/doi/abs/10.1890/10-0340.1). However, now my data are very non-normal again. I have tried experimenting with error terms to add to the logit transform but since have had no luck. Is there any way I can find a value to add to my transformation to ensure normality? I've had luck with setting epsilon to half of the smallest non-zero value and replacing all 0 values with epsilon and all 1 values with 1-epsilon. Then apply the logit transformation. 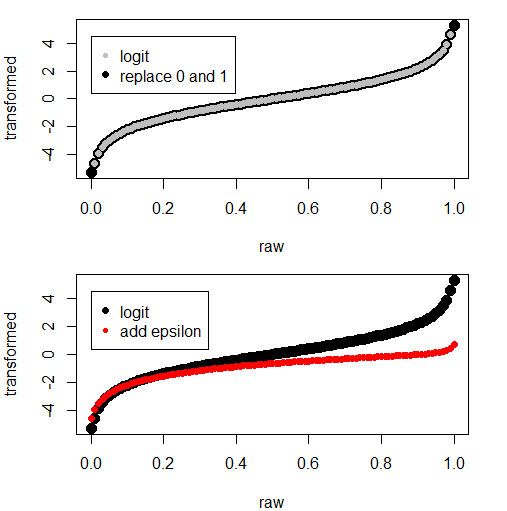 This method keeps the original form of the logit transformation, but allows 1 and 0 to be transformed to values that match the overall shape of the intended transformation (note the black dots in the figure at raw=0 and 1). In particular, it preserves the quality that 0.5 is transformed to 0, and the rest of the values are symmetric. On the other hand, adding the smallest non-zero value as described in the paper changes the shape of the curve and destroys the symmetry. Not the answer you're looking for? Browse other questions tagged regression data-transformation proportion logit or ask your own question. Clustering of very skewed, count data: any suggestions to go about (transform etc)?